"Here everybody's got a bad habit. Everything's urgent." This is one of those rare films that is so beautiful in an understated way that it's hard to talk about without going all gooey�when I gush with enthusiasm for Il Posto, I fear that I sound dangerously like ardent fans of such obvious claptrap as The Bridges of Madison County. But the pleasures of watching this film are many, and a brief accounting of it here is unlikely to do it justice. Nevertheless, here we go: Domenico (Sandro Panseri) is on the cusp of adulthood, living with his family in relative penury just outside of Milan. Today Domenico is off to take an exam at a corporation; if he passes, he'll secure what's essentially a job for life, guaranteeing him modest but desirable means. His little brother Franco still goes to school, but now it is time for Domenico to become a man. Many other young men and women arrive for the test as well, and it's a batty one. They're given an hour, for instance, to solve a basic algebra problem, and then are subjected to bizarre questions: "Do you suffer from frequent itching?" Anything for the dream of secure employment; and they're all so young and fresh-faced that they look like children playing dress-up. Domenico strikes up a conversation with Antonietta (Loredana Detto), a fellow applicant, and their makeshift first date, running back for the second half of the exam, is one of the many charming things in the film. She's eager for independence, and knows that "sooner or later I'll get married, and that will be that." We sense that Domenico longs for her, but he says little; his sad, knowing eyes speak volumes, though. 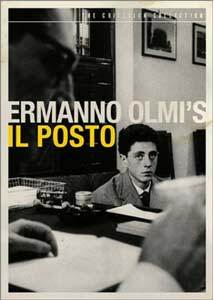 Ermanno Olmi has a keen feel for the silliness of offices, but also can find the poetry in the mundane—he can find the romance in an industrial hallway, for instance, and what's here is beautiful and captivating stuff. Many of the scenes play out in master shot, giving us a strong sense of place and a documentary-style sort of reality; Milan is the industrial capital of Italy, and lacks the lush romantic veneers of Rome, say, or Venice. The depth of field in many of Olmi's shots are especially accomplished and lovely, and give still more of a sense of the particularity of the place, and the poetry in his characters' unarticulated emotions. The final sequence is of a workers' New Year's Eve party, with Domenico looking fruitlessly for Antonietta; he finds some comfort and satisfaction in the bonhomie of his co-workers, though, and if this isn't a story about wishes and dreams fulfilled, it is full of compassion for its characters and it's a tale told with understatement and empathy. It's a lovely film, and is made with passion and with grace. Image Transfer Review: As an accompanying restoration demonstration makes clear, Criterion has put a tremendous amount of effort into making the film look as good as possible, and the transfer is first rate. Not all of the ravages of time can be eliminated, of course, but the blacks are saturated and there's little or no debris to be seen on the print. Audio Transfer Review: The mono track is unlikely to take your breath away in the manner that the picture may, but it sounds more than satisfactory, with only a bit of hiss here and there. Extras Review: The best of the extras is probably La Cotta, a 1967 short film (49m:10s) directed by Olmi in 1967 for television. It tells the story of Andrea, who at 15 fancies himself a ladies' man; he falls hard for and gets his heart crushed by Jeanine, a French girl who has recently moved to town. As in Il Posto, much of the action centers around New Year's Eve, during which Andrea finds himself a cuckold and finds some comfort in conversation with the older sister of one of Jeanine's friends. Olmi's compassion for the emotional upheavals of adolescence make this particularly memorable. Reflecting Reality (19m:47s) features Olmi discussing the featured film, which has many elements of autobiography. He worked as a young man for a utility company in Milan, and established their documentary department; he used his crew from work to shoot the feature on weekends, and had to sell the family home to complete the financing for the picture. Intercut are some brief comments from Tullio Kezich, an Italian film critic and occasional Olmi collaborator. The aforementioned restoration demonstration (04m:31s) shows the painstaking work that went into making the film look so good on this disc; a deleted scene has many of the charms of the feature, and seems to have been cut for time. The original trailer features a jazz score that you won't hear in the film; and the accompanying essay by Kent Jones is helpful in situating Olmi in the Neorealist pantheon, along with Visconti, Rossellini and Antonioni, and in calibrating the director's influence on later filmmakers, especially Martin Scorsese. Il Posto is a sweet and elegiac bit of filmmaking, and looks luminous on this disc. The well-chosen extras only add to the DVD's many charms. Highly recommended.